Squash vine borer (Melittia satyriniformis syn. Melittia cucurbitae) is mainly a pest of squash (summer and winter), pumpkins, and gourds. It occurs east of the Rocky Mountains from Canada to South America. The larval stage burrows in the plant stem or crown, disrupting the transport of water and nutrients, which results in wilting of affected plants or stems. Squash vine borer is primarily a problem on smaller-acreage diversified farms; for unknown reasons, it is rarely a problem in large-acreage fields. 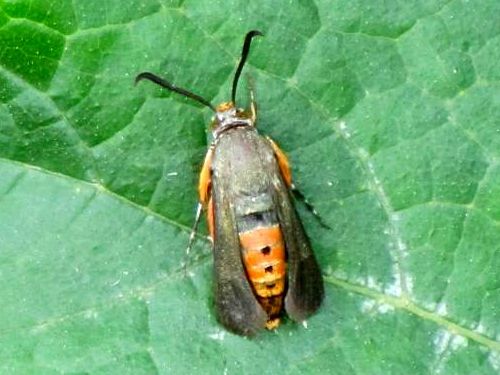 The adult squash vine borer is a distinctive clear-winged moth with a wingspan of 1–1 ½ inches and a black body with feathery orange scales on the legs and abdomen (Fig. 1). Unlike many moths, it is a daytime flyer and can sometimes be seen hovering in front of flowers feeding on nectar, or around cucurbit plants and vines where they lay their eggs. Figure 1. Squash vine borer adult. Figure credit: Brian Caldwell, Cornell University. Squash vine borers overwinter as mature larvae or pupae in the soil. Adults emerge in May in the South and in late June–July in the northern states. Because insect development is driven by ambient temperatures, degree–days are often used to forecast insect activity. For more information on using degree–days to predict insect development see Predicting Insect Development Using Degree Days. In Wisconsin, base-50 degree–days (DD50) are used to predict adult squash vine borer emergence, which is estimated to be around the time when 1000 (DD50) degree–days have accumulated (Delahut, 2005). Using information collected in a life history study in South Carolina (Canhilal et al., 2006), the duration of the pupal stage of squash vine borer was calculated to require 745 DD50 in rearing rooms maintained at 77°F. Depending on how much development an individual has to complete in the spring, first generation adult emergence can be expected between approximately 750 and 1000 accumulated DD50. Base 50 degree–days are also known as growing degree–days (GDD) and seasonal GDD accumulations may be available through your state Cooperative Extension system. Female squash vine borers lay small (1/25 inch) disk-shaped, reddish-brown eggs at the base of plants or vines. Eggs take 9–11 days (~245–300 DD50) to hatch (Canhilal et al., 2006), and larvae burrow into stems within hours of hatching (Welty, 2009). Larvae are wrinkled, whitish worms with a brown head capsule (Fig. 2). Figure 2. Squash vine borer larva. Figure credit: Clemson University - USDA Cooperative Extension Slide Series, Bugwood.org. Two overlapping generations of squash vine borer occur in the south, and one—and possibly a partial second—generation occurs in the north, depending on the accumulated degree days during the growing season. Larvae feed for approximately 25–27 days (~660 DD50) (Canhilal et al., 2006) and when fully developed (about 1 inch long), leave the plant to pupate 1-6 inches deep in the soil. New adults emerge 22–52 days later in areas where enough heat units accumulate (~745 DD50) (Canhilal et al., 2006). A second generation of adults could be expected to emerge around 2430–2680 accumulated DD50. In the north a second generation would be less damaging in the field because it occurs so late in the season, when crops are nearly mature, but could be damaging in late plantings in the south or in season-extension structures in the north. Wilting of the entire plant, in the case of bush type squash, or one or more vines, in the case of vining type cucurbits, is the most noticeable sign of infestation. Diseases such as bacterial wilt or Fusarium wilt can cause similar symptoms. The primary feature for distinguishing squash vine borer from the two diseases is frass (insect excrement), which resembles wet sawdust, accumulating at the entrance to the larval tunnel (Fig. 3). Figure 3. Squash vine borer larval tunnel, with accumulated frass. Figure credit: Alton N. Sparks, Jr., University of Georgia, Bugwood.org. Examine the base of wilted plants or vines for frass or cut the stem on the diagonal to find larvae, tunneling damage, and frass accumulations (Fig. 4). If Fusarium wilt is to blame, the vascular tissue in the cut stem may appear reddish or brownish. For more information on Fusarium wilt see: Fusarium Diseases of Cucurbits. For more information on distinguishing squash vine borer damage from bacterial wilt see: How to Distinguish Between Symptoms of Squash Vine Borer and Bacterial Wilt. Figure 4. Squash vine borer at base of damaged squash plant. If damaged plants are split open, the white, grub-like caterpillar can be found. These caterpillars show distinct external segmentation. Figure credit: Alton N. Sparks, Jr., University of Georgia, Bugwood.org. Disrupting mature larvae or pupae in the plants or soil by tilling in crop debris soon after harvest is the primary cultural practice for preventing a buildup of squash vine borer. This can be particularly important for crops such as zucchini or summer squash where growers often make succession plantings, and abandoned plantings may be left standing because of busy summer harvest schedules. Making the effort to till under abandoned plantings will help prevent buildup of damaging populations. This practice can also help moderate powdery mildew epidemics by eliminating sporulating tissue, and providing a window for a weed-smothering mid-summer cover crop. For more information on cover cropping see the eXtension articles on cover crops. Table 1. Attractiveness of cucurbit cultivars to egg-laying by squash vine borer (5 = most attractive, 1 = least attractive). While susceptibility to squash vine borer will not be the determining factor in your variety selection, knowing a variety's relative susceptibility can help you target your management efforts to the varieties at highest risk of infestation. If your main crop is a less-preferred variety, you can use the difference in varietal susceptibility to attract the bulk of egg-laying onto a more attractive crop planted around the perimeter of the field. Research at the University of Connecticut has shown squash vine borer reductions of 88% in main crops of zucchini or summer squash when a perimeter trap crop of Blue Hubbard squash is used (Boucher and Durgy, 2003). The trap crop can be either treated with an effective insecticide (see chemical control below) to prevent borer infestation, or destroyed after the peak egg-laying period is over to kill borers in the trap crop. For more information on perimeter trap cropping, see: Perimeter Trap Cropping for Yellow and Green Summer Squash. These techniques are only suitable for very small plantings. Examine stems during peak egg-laying and crush or remove eggs before hatching. If infestations are caught early in vining type plants, larvae may be removed by slitting the stem longitudinally near the entrance hole with a fine blade and covering the wounded stem with soil to promote new root growth (Welty, 2009). Before applying any pest control product, make sure to include what you might want to use and how you intend to use it in your organic system plan and get your certifier's approval. (Caution: the use of an unapproved material can result in the loss of certification.) Always check with your certifier before purchasing or using a new product or material to ensure that it is permitted for use in your organic farming system. For more information, read the related article, Can I Use This Input On My Organic Farm?. Spray timing is critical for effective chemical control of squash vine borer because the larvae begin to tunnel into the stem within hours of hatching from eggs (Welty, 2009), and once inside are protected from the application. Insecticide residues must be present at egg hatch so larvae contact or feed on residues as they enter the stem. Moth flights (and egg-laying) may be predicted by degree-day accumulations as described above or monitored by using pheromone traps. Small wire cone traps, nylon mesh Heliothis traps, and Unitrap bucket traps have been found to be most successful for monitoring squash vine borer (Jackson et al., 2005). Traps and lures may be purchased from Great Lakes IPM or Gemplers. Several insecticidal active ingredients approved for organic production are labeled for use against squash vine borer, including azadirachtin (neem), neem oil, kaolin clay, geraniol, thyme oil, pyrethrins, and spinosad. Of these, efficacy information is currently available only for spinosad, and the formulation used in the trial was not the one approved for organic production. This trial, conducted in Connecticut, showed that four weekly applications of spinosad applied during the moth flight resulted in control levels similar to a conventional pyrethroid insecticide. Reductions in average number of squash vine borer per plant ranged between 67% for a 0.5 oz/A a.i. (active ingredient) rate and 87% for a 1 oz/A a.i. rate (Boucher and Durgy, 2002). Stem injections of Bacillus thuringiensis (Bt) are frequently recommended for squash vine borer management, especially for organic gardeners. Trials in South Carolina compared spray application and stem injection of commercial formulations of Bt with a conventional insecticide and an untreated control (Canhilal and Carner, 2007). The injection and spray application methods produced similar results, and the Bt treatments provided control similar to that of the conventional insecticide. Note that Bt does not appear on the list of active ingredients currently EPA-labeled for use against squash vine borer. Because squash vine borer is only a sporadic pest in large-scale conventional production, it has received relatively little research attention. Attention to post-harvest crop destruction will help prevent economically damaging levels from building up. Application of approved insecticides to the base of plants can be effective for current-season control while employing cultural practices to reduce economically damaging populations. Efficacy trials are needed for most of the labeled products approved for organic production. Boucher, T. J., and R. Durgy. 2003. Perimeter trap cropping for yellow and green summer squash [Online]. Available at: http://ipm.uconn.edu/documents/raw2/Perimeter%20Trap%20Cropping%20for%20Yellow%20and%20Green%20Summer%20Squash/Perimeter%20Trap%20Cropping%20for%20Yellow%20and%20Green%20Summer%20Squash.php(verified 27 June 2011). Boucher, T. J., and R. Durgy. 2002. Effect of spinosad on winter squash pests, 2001. Arthropod Management Tests 27: E84. Canhilal, R., and G. R. Carner. 2006. Efficacy of entomopathogenic nematodes (Rhabditida: Steinernematidae and Heterorhabditidae) against the squash vine borer, Melittia cucurbitae (Lepidoptera: Sesiidae) in South Carolina. The Journal of Agricultural and Urban Entomology 23: 27–39. (Available online at: http://scentsoc.org/Volumes/JAUE/v23/27.pdf) (verified 27 June 2011). Canhilal, R., G. R. Carner, R. P Griffin, D. M. Jackson, and D. R Alvarez. 2006. Life history of the squash vine borer, Melittia cucurbitae (Harris) (Lepidoptera: Sesiidae) in South Carolina. The Journal of Agricultural and Urban Entomology 23: 1–7. (Available online at: http://scentsoc.org/Volumes/JAUE/v23/1.pdf) (verified 27 June 2011). Canhilal, R., and G. R. Carner. 2007. Bacillus thuringiensis as a pest management tool for control of the squash vine borer, Melittia cucurbitae (Lepidoptera: Sesiidae) in South Carolina. Journal of Plant Diseases and Protection 114: 26–29. Delahut, K. 2005. Squash vine borer. University of Wisconsin Garden Facts X1024 [Online]. Available at: http://hort.uwex.edu/articles/squash-vine-borer (verified 27 June 2011). Grupp, S. M. No date. The bug review: Squash vine borer [Online]. University of Illinois Extension. Available at: http://www.urbanext.uiuc.edu/bugreview/squashvineborer.html (verified 27 June 2011). Jackson, D. M., R. Canhilal, and G. R. Carne. 2005. Trap monitoring squash vine borers in cucurbits. The Journal of Agricultural and Urban Entomology 22: 27–39. (Available online at: http://scentsoc.org/Volumes/JAUE/v22/27.pdf) (verified 27 June 2011). Welty, C. 2009. Squash vine borer. Agriculture and Natural Resources Fact Sheet HYG-2153-09 [Online]. The Ohio State University Extension. Andrews, N., and B. Baker. 2010. Can I use this input on my organic farm [Online]? eXtension Foundation, eOrganic Community of Practice. Available at: http://www.extension.org/pages/18321/can-i-use-this-input-on-my-organic-... (verified 27 June 2011). Barbercheck, M. E. 2004. Entomopathogenic nematodes in biological control [Online]. eXtension Foundation, eOrganic Community of Practice. Available at: http://www.extension.org/pages/19199/insect-parasitic-nematodes-for-the-... (verified 27 June 2011). eOrganic Community of Practice. Cover Crops [Online]. eXtension Foundation, eOrganic Community of Practice. Available at: http://www.extension.org/pages/59454/cover-cropping-in-organic-farming-s... (verified 27 June 2011). Precheur, B. 2002. How to distinguish between symptoms of squash vine borer versus bacterial wilt [Online]. VegNet. The Ohio State University Extension. Available at: http://www.ag.ohio-state.edu/~vegnet/problem/pb81302.htm (verified 27 June 2011). Townsend, L., R. Bessin, and D. Johnson. 1998. Predicting insect development using degree days [Online]. The University of Kentucky College of Agriculture ENTFACT-123. Available at: http://www.ca.uky.edu/entomology/entfacts/ef123.asp (verified 27 June 2011). Zitter, T. A. 1998. Fusarium diseases of cucurbits. Fact Sheet Page: 733.00 [Online]. Cornell University Vegetable MD Online. Cornell University Department of Plant Pathology. Available at: http://vegetablemdonline.ppath.cornell.edu/factsheets/Cucurbits_Fusarium... (verified 27 June 2011).